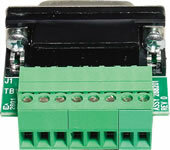 Need to convert the DB-15 connector to the euroblock removable screw terminals? The Connect O’ Adapter 15 MAX will do the job. The COA-15 MAX is designed to plug into the male 15-pin D-Sub connector on the WW1 IDC “MAX” or StarGuide II/III.